As the name suggests this is a fire sprinkler system fed directly by the town water main. As such there is no need to store the water in a tank or pump the water around the system. However a town water main fire sprinkler system is reliant on the consistency of water pressure provided by your local utility company. There must be a dedicated* 32-50mm (cat 1), 50mm (cat 2), 50-63mm (cat 3) incoming water main into the property. The water main must be unmetered – this is a requirement of the British Standard. The water flow rate varies between litres per minute (Cat 1, 1 head) and 240 litres per minute (Cat 3, 4 heads). If the town water mains supply in your building can not meet these criteria and a new supply is not an option then a stored water supply should be used. Pump and Tank Fire Sprinklers – this system is fed from water stored in a tank and pumped to the sprinklers. Ultrasafe offer servicing, testing and maintenance on all our fire sprinkler systems for more information please go to our page on Servicing and Maintenance of Fire Sprinklers. 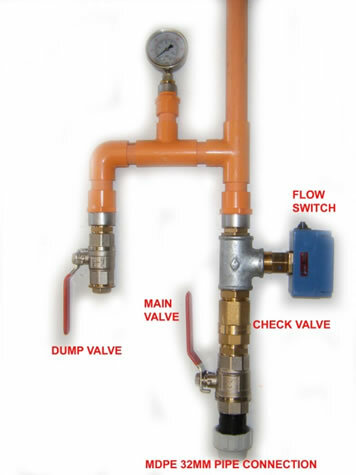 *If a dedicated supply cannot be provided then a priority demand (solenoid) valve can be fitted. This will divert water to the fire sprinkler system upon activation. However, an additional 25 litres per minute will be required on top of the design duty. Ultrasafe have many years of experience designing, installing and commissioning mains fed fire sprinkler systems. If you would like to see some examples of our projects see our water mains fed sprinkler system case studies.